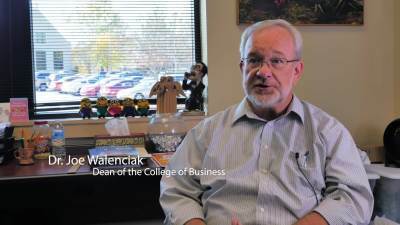 My name is Joe Walenciak, and I am a professor of business, and dean of the college of business. I did my undergraduate work at John Brown University. I majored in business administration with a minor in economics. I did my master's work at the University of Arkansas, and then returned to the University of Arkansas to get my doctorate. I've had the opportunity to do mission trips, studies programs, community development projects, and take group after group after group to Guatemala with the blessing of the University. What I really enjoy about teaching is watching students develop. Those moments where they get it. I get to go home and know that I was part of something significant, and that significant thing is being a part of the development of students. You watch young people of high potential come in as freshmen, and they begin to grow, develop. You get to see them transition into young professionals with tremendous potential, who begin to accomplish things, and you realize, I was a part of that. I had the privilege of being a part of that transformation.